Do It Yourself Pest Control Supplies for the Home, Yard and Garden. Call us toll free at 1-800-877-7290. HOW TO TREAT ADULT MOTHS FLYING IN THE YARD AND LANDING ON THE HOME? 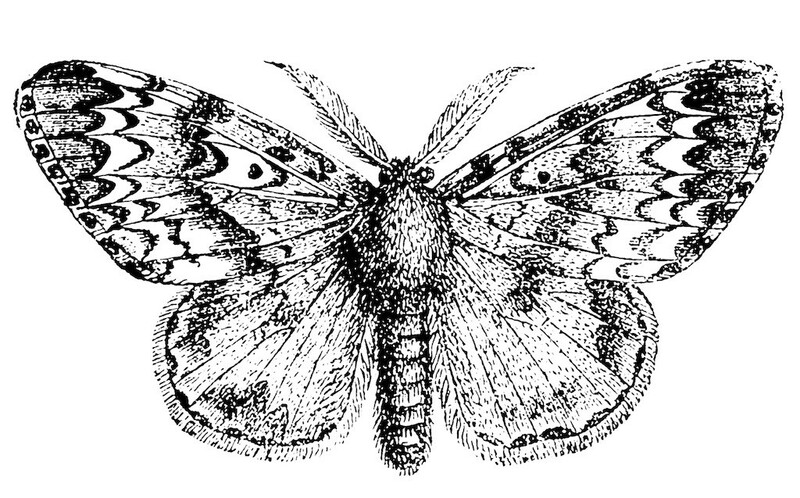 Gypsy Moths are small insects with a ferocious appetite. They’ll eat most any type of tree and their spring feeding frenzy can defoliate forests. Though their damaging behavior is most prevalent for 2-3 months each year, the impact of their feeding can be long lasting. 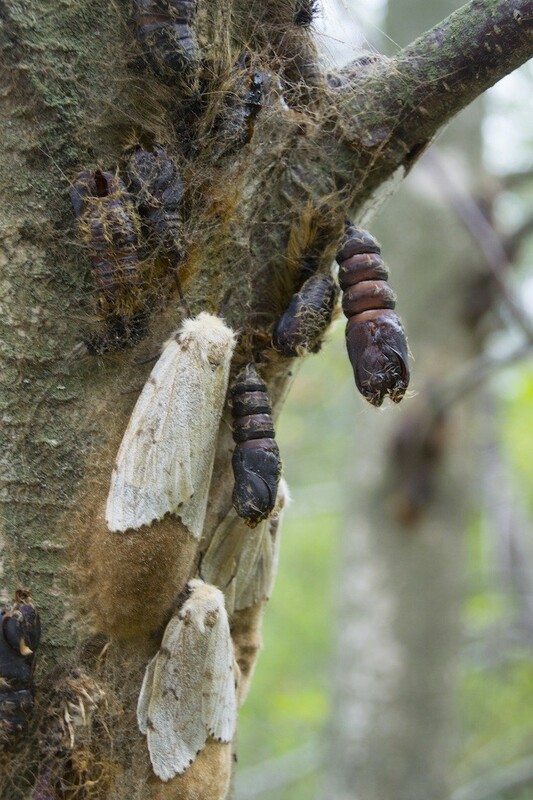 This article will provide some basic facts about gypsy moths and then offer treatment options to help control and contain local infestations. Gypsy moths are not native to North America. Brought to Massachusetts back around 1869, they were imported for the intention of silk farming. Some escaped and the impact of their presence was soon discovered across our countryside. Gypsy moths have a ferocious appetite and combined with a strong ability to reproduce, it didn’t take long for them to migrate across our country. Presently they are active as far south as Florida and they continue to migrate through the Midwest toward the west coast. They can feed on most any type of tree including oak, apple, beech, birch, willow and hemlock. Though it’s rare that any host tree will die as a direct result of gypsy moths, the loss of leaves will indirectly cause other problems. Fungus, disease and other parasitic pests will find damaged host trees leading to stunted growth and ultimately death. Needless to say, the end result of “importing just a few gypsy moths” was never imagined; at this time gypsy moths represent the single most significant threat to our forests. Gypsy moths have a simple life cycle. Eggs hatch small worm like caterpillars which feed on trees. These larva are tiny – so tiny they’re hard to see at first – but their silky webs will be both felt and seen everywhere once active. They use this silky web-thread to move up and down host trees. It will also enable them to migrate from one tree to another as the small light body of the larva is easily carried by the wind. This spring feeding will occur for 2-3 months. It will start in April or May and continue through July or August. 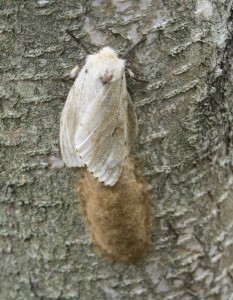 Once they have their fill, they will travel away from host trees where they will spin a cocoon and undergo metamorphosis. Later in the year they will emerge as adult moths ready to mate and lay new brood eggs to continue the growth of the local population. 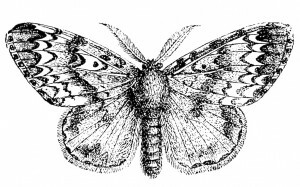 Once emerged, adult males have a strong desire to find females. This pursuit will happen during the dark of the night. Females will mate and lay eggs throughout the fall and die off as winter arrives. Before she dies, the average female will lay thousands of eggs. 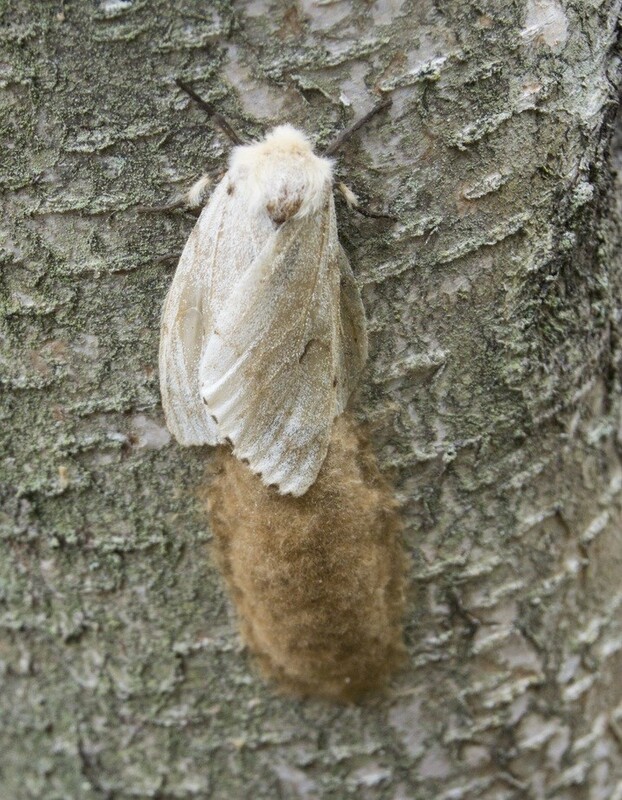 Her egg masses will be found on the bottom side of tree branches and bark of good host trees. Females also seem to identify a good egg laying location as homes and other man made buildings. This behavior seems to be one of the main reasons why gypsy moths have found their way into most residential neighborhoods. Ornamental trees also seem to be a food favorite and most any homeowners yard will provide ample hiding places for these egg masses. The average size of these masses will be 500-1000 eggs and if left untreated, these foraging young will cause a lot of damage in the following year! Now that gypsy moths are active in so many states, the goal of eliminating them has pretty much been abandoned. They’re here to stay. If you have activity in your community, it’s just a matter a “when” they will appear on your property. Fortunately there are treatment options that will keep them at bay and your trees protected. And though many local state and county government agencies have control programs in place, don’t expect their effort to keep your property free and clear of their damaging feeding. If you want to keep them out or if you already have actively feeding larva, there are a few ways to treat which will yield results. The key is using the right product and getting it applied to the right areas. First, it’s important to understand a few things about how and when the larva feed. One of the unique characteristics of gypsy moths is their natural instinctive behavior to feed at night. This behavior helps to minimize the impact local birds and other prey animals would otherwise have; many birds like to feed on insects but almost all do this during the day. For this reason its best to treat in the evening, just before dusk, so the application will get them when they’re most active! Gypsy moths will hide from the light. They will drop off trees via their webbing or crawl down tree trunks and seek refuge in rocks, mulch or other objects that surround host trees. They do this at the first sign of light and there they will rest during the day, well removed from local predators, and lie in wait till darkness once again returns. At that time they will crawl back out and go back to their damaging feeding. This distinctive feeding pattern means there are two ways attempt controlling local populations. In general, organic treatments will for gypsy moths will be slow to work and need to be done early in the season. They can be effective and if you have a few small plants, shrubs or trees to protect, certainly possible. The first organic option is THURICIDE. This product comes in a concentrated form and can be sprayed on any part of any plant. In the liquid is a bacteria which is harmless to people or animals. Commonly used to control mosquitoes once it gets on plant eating insects they too will die. It’s a little slow to work so be patient when using Thuricide and renew applications weekly till the activity is stopped. Remember, you need to get the targeted foliage sprayed so concentrate your treatments on where you see the most “chewing” damage. Mix 1 tablespoon per gallon of water (approximately 1/2 oz) and renew weekly until all activity ceases. A more direct and faster acting material that is still harmless to people and animals is INSECTICIDAL SOAP. Basically a derivative of common cleaning soap this formulation does a good job of killing on contact. However, it offers no residual and you will have to apply it over and over during the course of the active season. The big problem with using this product is obvious: larvae which come to treated surfaces just an hour after you spray won’t be affected. Without a good residual in place, expect the problem to renew itself every few days so be prepared to spray as needed. This could turn out to be a few times a week for any plant or tree you want to save. Use 2.5 oz per gallon of water and expect a mixed gallon to provide up to 500 sq/ft of foliage treated. Setting out GYPSY MOTH TRAPS is another “low impact” way to help reduce numbers. Our traps use a weather resistant casing to protect the glue pad and lure placed inside. Adult gypsy moths are dialed into this scent (as explained above) and will quickly find traps set in the yard or garden. 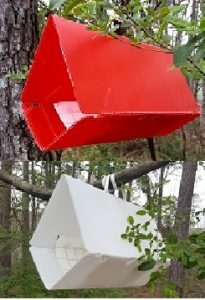 Available in both red and white, use one trap per 5,000 sq/ft. Traps come with a short hanging “tie” so you can secure them to tree limbs, garden stakes, etc. Each trap comes with a single glue pad and on the pad you need to place the lure. Do not handle the lure directly but instead, “pour” it out onto the glue pad. The lure is a small rubber “stopper” shaped object which has been soaked with the pheromone. Both lures and glue pads will remain active for 30-60 days but in badly infested yards, can fill up quickly. Pay attention to your traps and replace pads as they fill. If you have a bad situation and need immediate control and desire long lasting protection, use a traditional insecticide like CYONARA RTS. This concentrate is still relatively mild. Its odorless and labeled for use on vegetable plants so it won’t pose a hazard if applied to fruit bearing trees or plants. Cyonara will readily kill kill gypsy moths quickly and its easy to use. Treatments will last 2-3 weeks and all you have to do is hook it up to your garden hose and start treating. A single quart can cover up to 15,000 sq/ft so it goes a long way. Plus it uses the power of your garden hose water pressure so you should be able to reach 20-30 feet up with any decent amount of water force. If you already have a decent sprayer and want a concentrate, go with the permethrin based VEGETABLES PLUS. It’s odorless and like the Cyonara, can be applied to fruit bearing trees. Treatments will last 2-3 weeks but can be renewed more frequently if needed. Mix 2-4 oz per gallon of water and expect to get 500 sq/ft of foliage coverage per mixed gallon. If you don’t have fruit or vegetable bearing plants and want the most concentrated option, go with TENGARD PERMETHRIN. This concentrate is still odorless but is almost 4 times stronger than the Vegetables plus. Mix 1 oz per gallon of water and expect to get up to 500 sq/ft of foliage covered per mixed gallon. 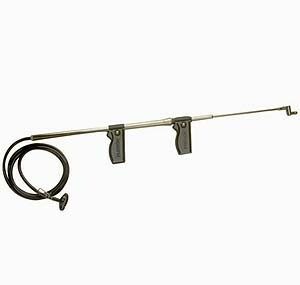 For most trees and shrubs 15 feet or less in height, any standard PUMP SPRAYER can be used to apply the products listed above (Thuricide, Soap, Vegetables Plus and Tengard). For trees 15-30 feet tall, a HOSE END SPRAYER will usually work well if you have strong water pressure. If you can’t reach your trees with a garden hose, a TROMBONE SPRAYER might do the job. It relies on “manual” power to spray and can spray up to heights of 30 feet or more. And all you need is a 5 gallon pail or some other tank holding the mixed solution you want to spray. If you have a lot of foliage to protect, consider fogging instead of liquid treating. On average, fogging will use about 1/10th as much chemical to get the same area treated. And it will do so 50% or more efficiently. Basically the “mist” or fog will cover all surfaces so you miss very little areas. Liquid spraying, on the other hand, is near to impossible to get all surfaces covered due to run off, the angles of the foliage and more. Furthermore, fogging takes a lot less time. On average, it takes 30-50 gallons of mixed solution to treat an acre along with 30-60 minutes of time. But this same area can be treated with 3-4 gallons of mixed solution in 10 minutes using either of the fogging machines listed below. Since gypsy moth larva naturally forage high for food its entirely possible they could be well beyond the reach of the average liquid sprayer. Mists will usually can reach 25-30 feet up with no problem and with a little bit of air current, 40-50 altitudes can be treated. For small lots of 1/2 acre or less, the FM6309 is a good electric machine. It can pump out 10 oz per minute and with its 1 gallon tank, most anyone can handle it around the yard. Use it to apply the Soap, Vegetables Plus or Tengard listed above. If you want to “cut the cord”, get a BACK PACK MIST BLOWER. These gas powered units have 3+ gallon holding tanks and can pump a gallon of mixed solution in 3 minutes. 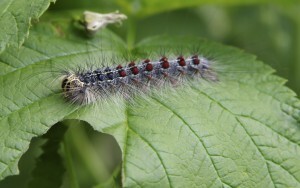 During the active season, gypsy moth larvae will be foraging onto the ground. This can happen by mistake or on purpose. Leaf litter and common mulch found under trees are prime areas for maturing larvae to use for pupation. For this reason its important to “spray low” when using any of the liquids above. For longer protection or if you have thick mulch such as pine straw, rocks or wood chips, you’ll be best served by applying DELTAGARD GRANULES to the area once a month. Granules will penetrate the mulch more effective than any liquid and if you have heavy infestations in trees with thick mulch underneath their drip line, this is an important area needing treatment. Apply Deltagard at the rate of 1 bag for every 10,000 sq/ft and renew monthly for 3 months from spring to summer. Apply the granules with any standard push spreader or HAND SPREADER like this one. To stop adult moths active in the yard, spray with any of the products listed above. The most effective will be the TENGARD PERMETHRIN. 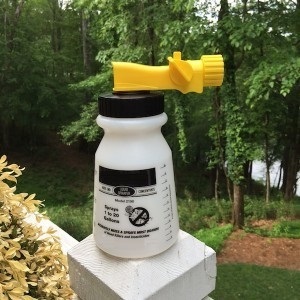 It can be used on the turf, plants and the side of the home using any of the sprayers. 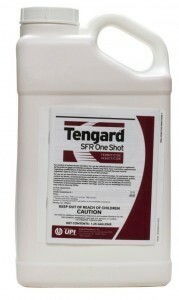 Tengard will both kill the adults and keep them away and off treated surfaces. This will help reduce egg laying in the yard and should be applied as soon as you see them flying around. Gypsy Moths are a major pest across the United States of America. If they’re active in your region, be aware of local activity and watch to see if they land on your property. Even if you don’t have any active, it’s a good idea to apply Thuricide to any plant you’d like to keep around if gypsy moths are in the area. This “pretreatment” will help minimize damage should some find your plants. Once gypsy moths are established, an aggressive approach will be needed. Use a combination of the sprays and granules listed above for bad infestations and set out traps to help keep reproduction minimized. Gypsy moths are here to stay and if you value your trees and other landscaping, you don’t want them moving onto your plants and eating them alive. Give us a call if you need further help. Our toll free is 1-800-877-7290 and we’re open Monday through Thursday, 8:00 AM to 7:00 PM. On Friday, 8:30 AM to 5:00 PM and on Saturday, 9:00 AM to 2:00 PM (Eastern Standard Time). Order online and get a 5% discount! We ship fast with 99.9% of all orders shipping within 1 business day!! 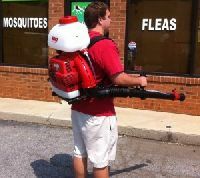 Learn more about BUGSPRAY.COM and why it’s never been easier or safer to do your own pest control. Please show your support for our business by purchasing the items we recommend from the links provided. Remember, this is the only way we can stay around to answer your questions and keep this valuable web site up and running. Thanks for your business! Hello, I am in desperate need of some help. I have an infestation of gypsy moths in my car. I have a very large yard with lots of trees and shrubs. One night about a month ago, the windows in my car were mistakenly left open. It was a couple days afterwards that we realized my car was infested with these moths. They mainly hide out during the day and come out like crazy during the night-time. They have literally infested my car. Do you have any suggestions on things I can use inside my car to eradicate them? I need to use a product that is safe for infants as we are due to have a baby any day now. Thanks so much!!! This is an easy one. We commonly have customers who need to treat a wide range of insect problems that develop in cars. The most common would be roaches, ants, beetles and moths. Now even though gypsy moths aren’t common, it does happen. And it can happen without the windows being left open. The reason is simple. If you park a car underneath a tree canopy that has any kind of pest, its just a matter of time before the car gets infested. We’ve seen this happen with whiteflies, aphids, wasps, ants, gypsy moths, tent caterpillars and more. So in the future, it would be wise to treat the problem in the trees so to avoid this exact issue. As for your infested car; get some Phantom aerosol and treat every crack and crevice both inside and outside the auto being sure to apply it lightly and with the included injecting straw. Phantom is both odorless and goes on dry so it won’t leave any kind of residue or odor. This makes it ideal for use in the cab, around door frames, engine compartment, etc. Phantom is unique in that insects can’t detect it so they will commonly walk over treated surfaces. Now it won’t kill them fast but within 3-4 days, any that touch it will die. And since the larvae will be moving around in the car, they’ll surely come in contact with the material as long as you do a good treatment. I recommend treating once a week until there is no activity and if you continue to park the car under trees which are infested, treat once a month to insure the car doesn’t get infested again. Give us a call if you need more help. Our toll free is 1-800-877-7290 and we’re open 9:00 AM to 6:00 PM Mon-Thur; 8:30 AM to 5:00 PM Friday and 9:00 AM to 1:00 PM Saturday, Eastern Standard Time. PS: Please show your support for our business by purchasing the items we recommend from the links provided. Remember, this is the only way we can stay around and be here to answer your questions and keep our web site up and running. Thanks for your business! I have an infestation of gypsy moth caterpillars. They are crawling up the sides of the house and over the deck by the hundreds. Is there any product to apply to the foundation or any other method you can recommend to get rid of these caterpillars? Thank you in advance. We’ve got two viable options depending on the size of the lot you need to treat. For small lots, go with Cyonara. It hooks to your hose and is “ready to spray”. It will kill active caterpillars and offer decent repellency action to deter more from coming. For large lots (10,000 sq/ft or more), go with Bifen XTS. Its stronger, covers a much larger area and will last longer per treatment. You’ll need a hose end sprayer to apply it. Pine weevils eating my white pine trees!